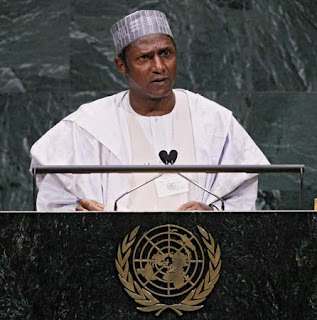 Umaru Musa Yar’Adua (16 August 1951 – 5 May 2010) was the 13th President of Nigeria. He served as governor of Katsina State in northern Nigeria from 29 May 1999 to 28 May 2007. He was declared the winner of the controversial Nigerian presidential election held on 21 April 2007, and was sworn in on 29 May 2007. He was a member of the People’s Democratic Party (PDP). In 2009, Yar’Adua left for Saudi Arabia to receive treatment for pericarditis. He returned to Nigeria on 2 May 2010, where he died on the 5th. The immediate family members of former President Umaru Musa Yar’adua, who died on May 5, 2010, are in London and plan to hold special prayers to mark his sixth anniversary. A source in the family said they were led by Yar’adua’s widow, Hajiya Turai and would offer special prayers for the repose of the former Nigerian leader’s soul.